Mariachi Aztlán de Pueblo High School performs at the student showcase of the Tucson International Mariachi Conference. In creating this new documentary on the rise of mariachi and folklórico culture in Tucson, I am not trying to suggest that the national movement started in Tucson. Nor am I denying the possibility. I’m hoping that part of the outcome of this film will be that other important cities in America’s mariachi movement will start to research their own mariachi timelines, so that collectively we might arrive at a clearer picture of when and where the phenomenon started, and how it evolved. Please feel free at any time to point me in directions I have not yet seen or offer corrections. The goal is not ego or possession, it is historic accuracy. Tucson has its clear landmarks. The start may be the mariachi club started by Adolfo Loustaunau at El Casino Ballroom in the late 1940s and early 1950s. Mr. Loustaunau was one of the founders of El Casino Ballroom (see “Tucson’s Heart and Soul: El Casino Ballroom” documentary, 2012) and a man of some considerable community vision. According to mariachi pioneer Tony Garcia of Mariachi Tucsonense, this mariachi club both brought in mariachis from Sonora to entertain at the ballroom and took kids on field trips to Nogales, Sonora and Guadalajara. Mr. Garcia recalls meeting Silvestre Vargas, leader of the gold standard Mariachi Vargas de Tecalitlán, in a hotel lobby in Guadalajara when he was a teen and being starstruck by his idol. In 1964, Father Charles Rourke started Mariachi Los Changuitos Feos – the Ugly Little Monkeys – in Tucson. That group, which is about to celebrate its 50th birthday, could be the first and is likely the longest continuously running youth mariachi in America. It was certainly a highly influential group, establishing the practice of charging for performances, investing the money, and sending the students to college. Its early members traveled the U.S., played in Mexico and did some international performances as well. From its ranks came the founding members of Mariachi Cobre, along with college level mariachi educator Dr. Jeff Nevin and many more. 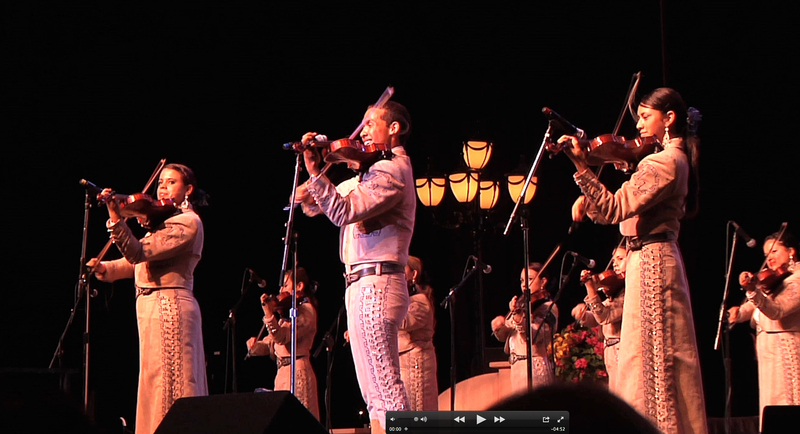 Although the first mariachi conference was held in San Antonio, the Tucson International Mariachi Conference prides itself on being the longest continuously running conference in the world. Still, the inspiration for the Tucson conference was the San Antonio conference a few years prior. There is general consensus that Tucson’s folklórico dance roots can be traced to choreographer Angel Hernandez, who came to Pima Community College in the 1970s and started its program. Along with cataloging the chronology of Tucson’s mariachi movement I will be trying to document as well what it has meant to this city culturally, socially and with respect to education. This will be done not through narration or summation but rather directly from the words of the film’s interview subject. Analysis and summation will be saved for a book project or something of that order made after the film’s close. As with past installments of the Cine Plaza at the Fox documentary series, which focuses on the history and cultural evolution of Tucson’s Latino culture, all video clips, interviews, photos, interview transcripts and other materials associated with the film will be turned over to the Arizona Historical Society at the film’s conclusion. It is hoped that these will provide primary source research materials for others tracking down the history of mariachis. I ask your help in guiding me toward important sources, and sharing whatever photos you might have that might give a clearer picture of how all of this has evolved. ~ by Daniel Buckley on January 5, 2013. Great work you are doing, Dan. Is is an honor to know you. Look forward to seeing you in Tucson and in Rosarito this year.Feliz y Prospero Ano Nuevo to you and yours.